In a bit of revisionist history, the garden at the Frick Collection designed by the world-famous British landscape architect Russell Page (1906-1985) and once hailed by the New York Times as one of his "most important works," has been downgraded by museum officials to nothing more than an interim land use. The garden occupies space the museum wants for a proposed addition. Consequently, in order to demolish it, Frick officials seek to diminish it saying the garden "has always been inaccessible to the public" (despite photos of parties held there and the fact that it was purpose built as a viewing garden) and was "temporary." This "temporary" idea is an important talking point in the Frick's justification; the garden's supposed planned obsolescence is foundational to their argument. There's only one problem -- the Frick created this verdant oasis as "a permanent garden" -- at least that's what the museum's own February 4, 1977 press release about it states. An anonymous source recently sent me the seven page release (with a note saying "This document is on file at the Frick Art Reference Library") and directed me to the fourth paragraph on page six -- there it is, plain as day: "a permanent garden." Russell Page garden at the Frick Collection. Photograph by Michael Dunn via Flickr. So what's going on here? The genesis of this Edenic spot grew out of a controversial Frick expansion plan in the early 1970s. As contemporary news reports and the museum's 1977 press release note, since 1940 Frick trustees had been setting aside funds to purchase three adjacent properties on East 70th Street. The last, Number 5, the former home of arts patron George Widener, was acquired in 1972. 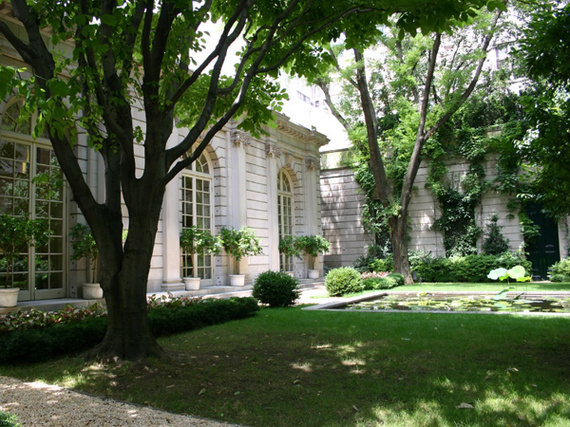 Following several contentious months involving the Frick, its neighbors and municipal officials, on July 6, 1973, New York City's Landmarks Preservation Commission acceded to the museum's request to raze the 1909 Louis XV-style Widener building and create a temporary garden that ultimately would be replaced a decade or two later by an addition. Within a few months, however, the expansion plan was shelved due to high costs. 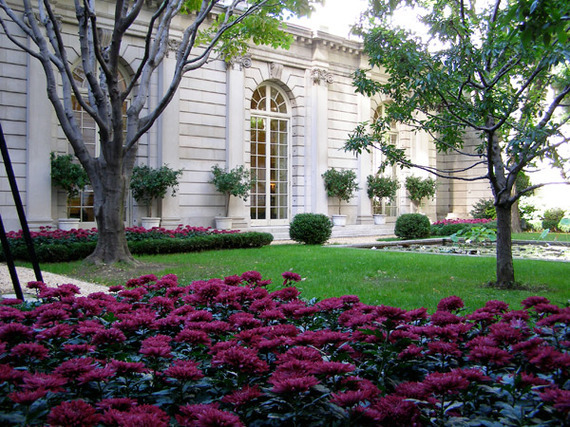 As the New York Times' Glenn Fowler reported on November 28, 1973: "The Frick Collection has abandoned its plan for eventual construction of a wing to the east of its museum site at Fifth Avenue and 70th Street, and instead will create a permanent garden and terrace on the space earmarked for the wing." New York Post reporter Roberta Gratz, quoted the Frick's then director Everett Fahy as saying the museum planned a "permanent" garden for the site. 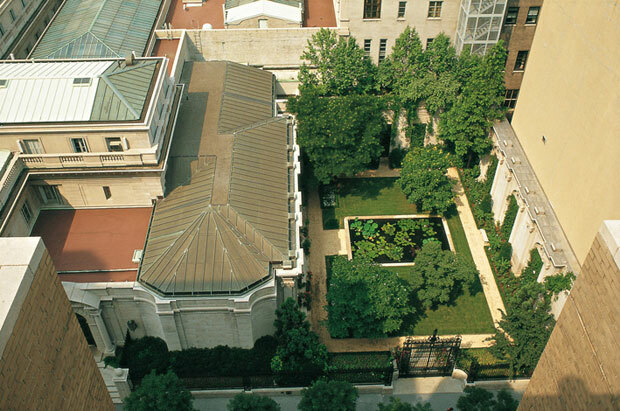 Aerial view of the Russell Page garden at the Frick Collection. Photograph from The Gardens of Russell Page. "[B]ecause of the high estimates received on the cost of the temporary garden, it was decided instead to reduce the size of the projected wing and to erect a small one-story pavilion and a permanent garden. These revised plans were accepted by the Landmarks Commission on May 23, 1974, and construction began in May of 1975." "The limestone for the pavilion's exterior and for the garden walls came from the same Indiana quarries as did that used in the original building and in the additions made to it when the residence was converted into a museum in the early 1930s. The garden walls incorporate carved stone reliefs taken from the east wall of the original house at the time of the conversion, and the iron gates that once stood at the entrance drive to the house have been re-erected in the front of the garden, flanked by a wrought iron fence made to match the earlier fence around the main building." Page's creation at the Frick is an elegant, nuanced work of art that was realized over the space of ten years. As I have written before, a museum's designed landscapes should be afforded the same degree of importance and curatorial care as their buildings and other parts of their collection. That certainly applies here. Russell Page garden at the Frick Collection. Photograph by Henk van der Eijk via Flickr. It's also important to consider the context under which Page accepted this commission. According to Nancy Berner and Susan Lowry's Garden Guide: New York City (W. W. Norton & Company, 2010), the Frick "is one of a number of public projects the English designer undertook at the end of his life, hoping to preserve his reputation for posterity." The final chapter of The Gardens of Russell Page (Frances Lincoln, 2008) added a poignant note: "Toward the end of his long career Page was keenly aware that of the hundreds of gardens he had designed, many had disappeared. He hoped the ones he was doing in the public sector might find permanence." Let's hope the Frick can honor its commitment to Page and to us. 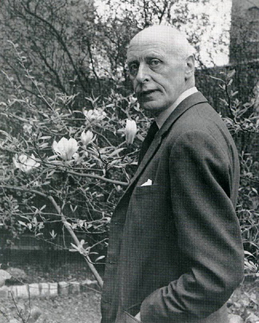 Russell Page, photograph courtesy The Cultural Landscape Foundation.